Watching the London Olympics this weekend brought back many fond memories of my sport psychology work with many summer and winter Olympic athletes decades ago. I am reminded that at that level of competition, what separates the medalists from those close behind is one’s mental attitude… in the face of adversity. It’s called “mental training.” Not only does mental training include meditation (increased focus and concentration), mental rehearsal; mental imagery and visualization, Team dynamics and confidence building, but also a heavy dose of optimism. Perhaps it’s no secret that these same attributes are necessary for each and every one of us, whether we are headed for Olympic competition, or headed to work on Monday morning. Research reveals that an optimistic attitude is also good for the immune system. Optimism isn’t a denial of reality. It’s the fulfillment of your highest potential. Optimism is more than silver linings and lemonade. It’s a knowing that in the end, it will all work out wonderfully. But our positive attitude is what gets us there. Make a habit of looking for the good in things today. While you are at it, look for the good in each person as well. When you see/meet someone whom you meet resistance with, have compassion that the dark cloud over their head has momentarily eclipised their light within. 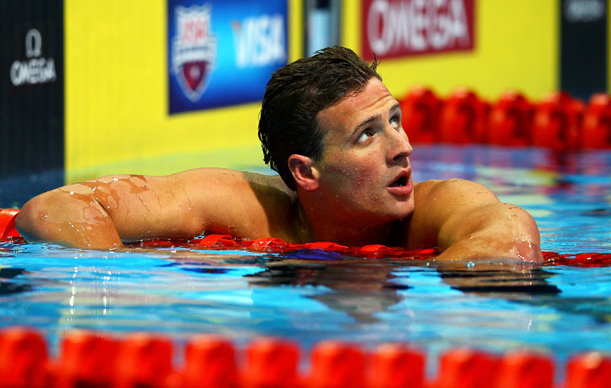 Hot off his victory in the 400 meter IM, Ryan Lochte is the new poster boy for optimism; a reminder for all of us to strive for our highest potential. Go Ryan! Don’t abandon all hopes for quality today. Merely recalibrate your expectations by getting out of the way of your ego. Demanding perfection of yourself is futile (it’s just another ego-based control drama). Instead, sets your sights on excellence. Remember that excellence takes practice (and at times, some frustration). As you go through your day today, cast off the filter of ego, and reach for your highest potential, even if there are a few mistakes along the way. After all, mistakes are stepping stones to excellence. Several years ago author Terry Orlick came out with a book called The Pursuit of Excellence. It’s now in it’s fourth edition and the message is timeless. There are no perfect photographs either (that’s why there is cropping.. and Photoshop). 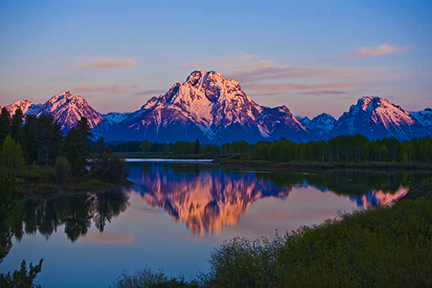 Here is one of my favorite shots of the Tetons at Sunrise I took several years ago. Enjoy! How does one make sense of a senseless act of violence? Try as we might to understand these (fill in the blanks here __________) acts, ones that clearly promote stress, most likely, we never will. 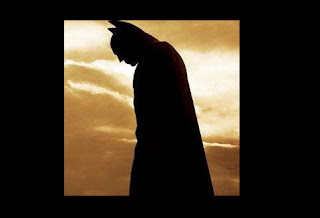 Like many of you, I woke up this morning to hear of the tragedy at the midnight showing of the new Batman movie. Unlike most of you, this act of senseless violence took place within an hour of where I live, making it all the more palpable. Grieving experts remind us that our first reaction to something like this is shock, followed by disbelief, for some anger, then resignation. Even if we can never make sense of such a stupid, egotistical, senseless act, once we are done mourning, we must move on with our lives. For failing to move, we become one more casualty in this senseless assault. If there is one thing this day teaches us, it reminds us all that life is precious, and we must never take anything for granted, including those whom we love and those who love us. Days like today remind us to stop and offer prayers and healing energy to those who must literally pick up the pieces of a senseless tragedy. Days like today remind us to help those less fortunate than ourselves, for we are all connected together as one human family. Days like today remind us to take time to grieve (through the entire spectrum of emotions) and then release, detach, forgive (if necessary) and move on. We many never fully understand such a tragedy, but we can prevent ourselves from giving our power away to those who commit such acts of anger and violence. Years ago in graduate school I came across a great book about grieving called Necessary Losses by Judith Viorst. If you can ever get your hands on this book, I highly recommend it. “When your fear touches someone’s pain, it becomes pity. When your love touches someone’s pain, it becomes compassion.” — Steven Levine. Many photos have appeared on Facebook today in memory of those who died last night in Colorado. A days like this leaves me in a quandary as to what to post for a photo. At the time of writing this, this one seemed to catch my eye despite the fact that I am not really a Batman fan. I may change it, but for now here goes…..
To live in harmony with nature means many things, not the least of which means to live in a correct pace of nature. Summer heat tends to cause one to slow down (good idea!). It’s also a reminder to eat less, as we expend less calories. We should take the hint and begin to live a slower paced life. A slower paced life could include sitting on your front or back porch in the late afternoon/evening getting to know your neighbors, too. It might include preparing some vegetarian meals (cool fruits and veggies for diner). Take time to slow down today, and the rest of the summer. Drink some iced tea. And give thanks for the invention of AC. If you find your buttons getting pushed, remember anger and heat connection. Don’t give your power away. If you haven’t see Al Gore’s movie (lately) it might serve as a great refresher of what is going on now. “Those who contemplate the beauty of the earth find reserves of strength that will endure as long as life lasts. There is something infinitely healing in the repeated refrains of nature, the assurance that dawn comes after night and spring after winter.” — Rachel Carson. Today’s flower is a fuchsia bloom that I photographed at the base of Crough Patrick near Westport Ireland. 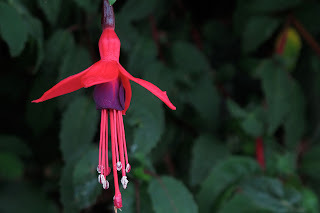 By the way, I have noticed that some of my plants that don’t usually bloom until August started blooming the last day of June. Ugh! Science is proving what the sages and mystics have know for eons; when people open their hearts, in an act of compassion in action, everyone benefits, including the people giving of themselves. From a boost in positive neuropeptides to remarkable synchronicities, helping others has some remarkable consequences. The bottom line is that we make the world a better place, if only for one person, if only for one moment. And the world is only made up of moments. To give of ourselves selflessly is a noble act indeed. In doing so, the soul’s light shines bright. As the saying goes, in giving we receive. What makes random acts of kindness so special is that the anonymous act is one where nothing is expected in return. The gift is unconditional. An unconditional gift or gesture is the highest form of love. Random acts of kindness are anonymous acts of generosity; true altruism. It might be handing a homeless person a dollar bill. It might be paying the toll for the person behind you on the highway. I could be simply smiling at someone behind the cash register who is having a bad day. There are many lonely people sitting in hospitals who by receiving a loving intention would be forever grateful. And if you need to think of someone specifically, I have a friend named Michael, who could use some prayers and healing energy with his prolonged hospital stay through the end of August. Thanks! My publisher, Conari Press, first published the book, Random Acts of Kindnessnearly 20 years ago. It’s a good a read now as it was when it first came out. Enjoy! 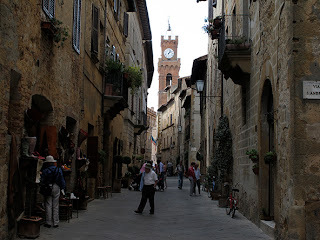 This photo was taken last year while I was in the small village of Pienza, Italy, in the Tuscany region. 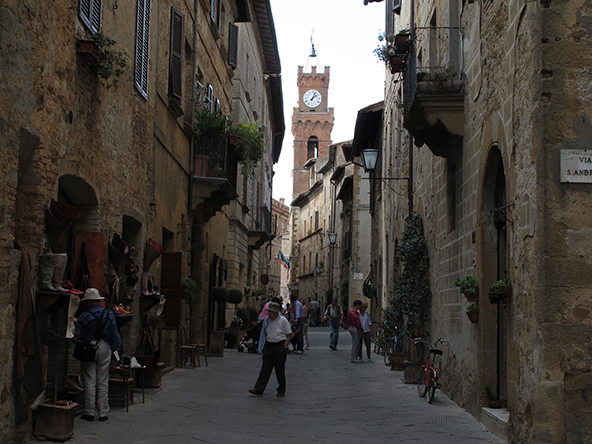 This is the town where Franco Zephreilli filmed the now classic movie, Romeo & Juliet. Enjoy! Somewhere in the course of today, close your eyes for a few moments and take a metaphorical step back from your life. Imagine how someone from Greenland might view your life. How might a dying person view your life? Imagine how a destitute person might perceive your life. How might your great-great-great grandmother or grandfather view your life? Once you play with these perspectives in your mind, remind yourself how good you really have it. And once you can learn to step back, realize the importance of being “above the fray,” in a fast-paced world where there is much negativity and ego-based fear mongering. Whether it’s a meditation practice or a tropical vacation, these times of stepping back are a reminder to “ be in this world, but not of it.” Please make a habit of it. A documentary movie called Winged Migration, follows several species of birds with some of THE most incredible footage ever filmed. Not only is it a great film, but a great reminder to stay above the fray. 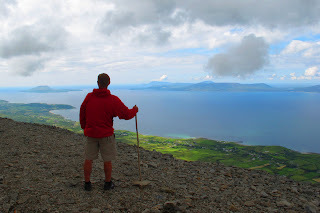 Today’s photo was taken a few weeks ago on the top of Crough Patrick, a sacred mountain near Westport, Ireland. I climbed the mountain with several people from our tour, including Matt, pictured here, wearing the famous red jacket. Thanks Matt. Enjoy!